Heart Shaped Bowl. 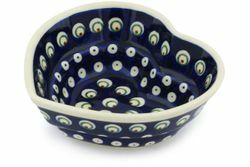 Each of the Polish Pottery serving bowls is one of a kind. Use this cute heart bowl for baking a small cake or as a candy bowl. This stoneware bowl is beautifully decorated both inside and out and makes a great addition to your polish pottery dinnerware set. Each stoneware bowl is a unique creation by talented artisans from Boleslawiec, Poland.